Ethanol, hereafter referred to as alcohol, is produced by the fermentation of sugar by yeast, a process that halts at a concentration of alcohol by volume of approx 15% because of the death of yeast above these levels. As a rough guide, one measure of spirits, one glass of wine, or one half-pint of beer contain 1 U, or 8 g, of alcohol. However, there is a variation in the alcohol content of different drinks (126), and any accurate assessment of intake must bear this in mind. In the European Union, there is now international agreement about the labeling of alcohol content, with the alcohol content of beverages being referred to by the percentage alcohol by volume (percent v/v) (127). This is equivalent to the number of milliliters of pure alcohol per 100 mL of the drink. In the United States, alcoholic strengths are measured in terms of percentage proof. US proof spirit contains 50% of alcohol by volume, so to convert US proof to percent v/v, one simply divides by two. Most people who have alcohol in the body have drunk it, although it can be absorbed into the systemic circulation through the lungs (blood alcohol concentrations of up to 50 mg/100 mL have been achieved after breathing alcohol/air mixtures for several hours) (128). Little or no alcohol is absorbed through the intact skin of adults. 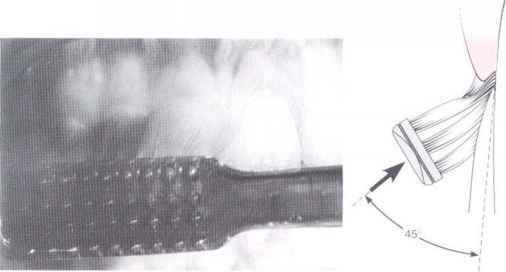 Once ingested, alcohol is subsequently absorbed into the body by a process of passive diffusion that occurs across the mucosal surfaces of the gastrointestinal tract (129). As liquids pass quickly through the mouth and esophagus, little absorption occurs until alcohol has reached the stomach. The rate of absorption is maximal in the duodenum, because its mucosa is thinner and blood supply more abundant than that of the stomach. Accordingly, any condition that delivers alcohol into the small intestine more quickly than normal, such as gastrectomy, will lead to more rapid absorption and an earlier, higher peak blood alcohol level (130). Hours after drinking Fig. 1. The blood alcohol curve. rated at relatively low alcohol concentrations, it soon reaches its maximum working rate, and alcohol elimination proceeds at this constant rate (131). 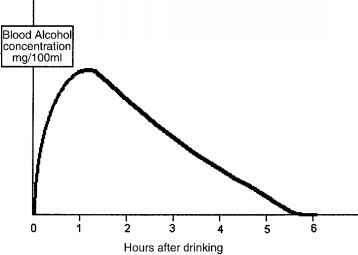 The rate of absorption is much faster than the rate of elimination, giving rise to the characteristic blood alcohol curve, as described by several researchers (Fig. 1) (132-134). Generally speaking, the peak blood alcohol concentration is reached 30-60 minutes after drinking, although the range may be anything from 20 minutes to 3 hours. However, the peak blood alcohol concentration, the time taken to reach the peak, the area under the blood alcohol curve, and the time taken to reach a zero blood alcohol level varies from person to person and within the same person over time (135). Indeed, several factors can influence the kinetics of alcohol.